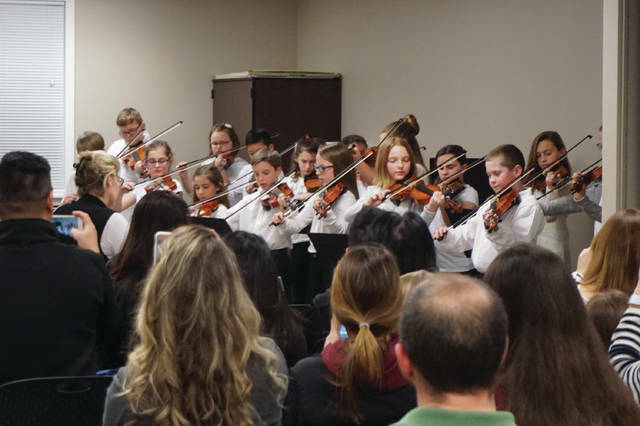 Students in the Big Walnut Intermediate Orchestra perform at the Board of Education meeting in Sunbury on Feb. 15. 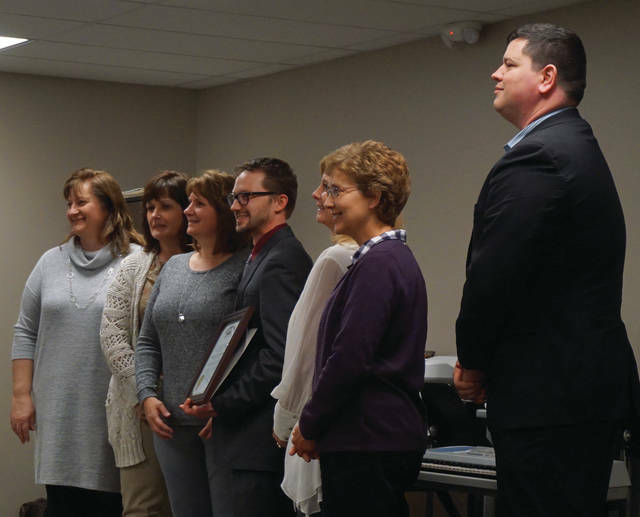 Treasurer Jeremy Buskirk (wearing glasses), his staff, and auditor Tim Kraft (far right) pose for a photo in recognition of Big Walnut Local Schools receiving the Ohio Auditor of State Award with Distinction. The Big Walnut Board of Education received a treat before getting to business during its meeting on Thursday. Proud parents filmed the concert and snapped photos of the young string musicians as they performed. The board was told the orchestra began this school year, and the musicians practice two or three times a week, plucking and bowing. Delaware Area Career Center board member Jim Hildreth, who was on hand to give an update on DACC, said hearing the orchestra made him glad he had served for 24 years on the Big Walnut BOE. As is the case with Big Walnut, there were other accolades given out at the meeting. Tim Kraft, of the state auditor’s office, presented Treasurer Jeremy Buskirk the Auditor of State Award with Distinction. Buskirk called up his staff to share in the honor. 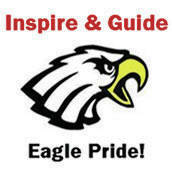 Also receiving recognition were Macy Maxeiner, General Rosecrans Student of the Month; Nathan Severs, Big Walnut Intermediate Student of the Month; Langley Bishop, General Rosecrans Art Student of the Month; and Carter Dancer, Big Walnut Intermediate Art Student of the Month. The school shooting earlier this week in Parkland, Florida, that took the lives of 17 students and teachers, weighed heavily on the minds of board members and administrators. Superintendent Angie Pollock said the district takes school safety very seriously, and that security upgrades were being made to all the district’s buildings. Board member Brad Schneider said it seemed like school shootings involve a shooter that is either a current or former pupil of that school who had problems that weren’t being addressed. He also wanted to hear from a school resource officer about what is being done to protect students. Fagan urged those remaining at the meeting to call local State Rep. Rick Carfagna about the issue at 614-466-1431.
https://www.delgazette.com/wp-content/uploads/sites/40/2018/02/web1_BWI-Orchestra.jpgStudents in the Big Walnut Intermediate Orchestra perform at the Board of Education meeting in Sunbury on Feb. 15.
https://www.delgazette.com/wp-content/uploads/sites/40/2018/02/web1_Jeremy-Buskirk-Auditor-Award.jpgTreasurer Jeremy Buskirk (wearing glasses), his staff, and auditor Tim Kraft (far right) pose for a photo in recognition of Big Walnut Local Schools receiving the Ohio Auditor of State Award with Distinction.